Buoy and Oyster is a family run restaurant overlooking the beach in Margate, Kent. 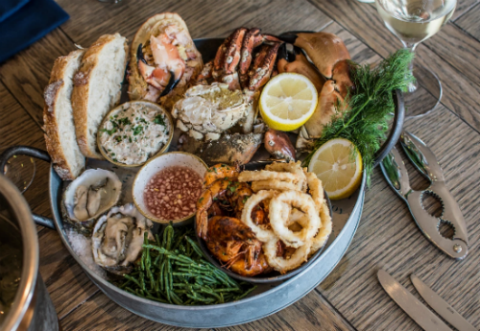 First opening in November 2015 and newly refurbished for 2019, husband and wife duo Simon and Nadine and their team have been gaining a reputation for providing customers with great quality food and service in a relaxed and stylish seaside setting. 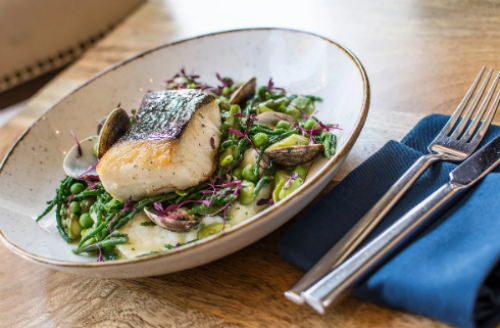 Located in both the garden of England and on the British coastline, our talented chefs have access to a fantastic supply of local fresh ingredients which is showcased in our seasonally changing menus. Guests can enjoy their meal with uninterpreted sea views & the famous Margate sunsets whilst being well looked after by our professional & welcoming team. Joining us in the restaurant? Dine in a more formal setting, choosing from our restaurant, seafood bar & vegan menus (mix and match from both) Chose from well loved seaside classics alongside innovative and modern cooking techniques. 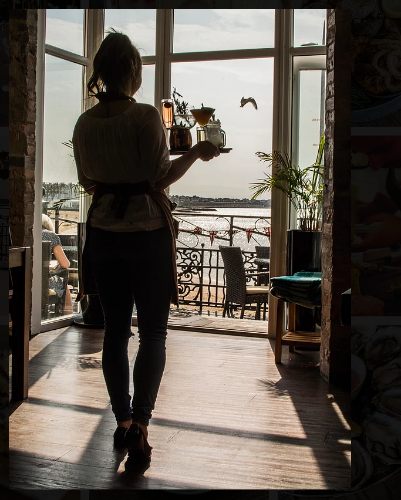 Our aim is for guests to enjoy a unique & memorable dining experience by the sea with sea views from every table & friendly service from our experience front of house team. Joining us in the Seafood Bar? 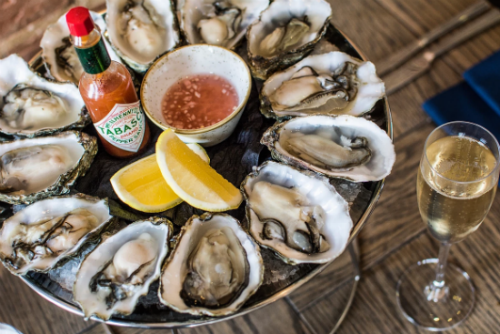 Enjoy cocktails, Kentish wine & beers alongside local oysters, seafood platters, small plates (& of course fish & chips) in a relaxed and buzzy setting, chat to the chefs as they prepare your meal by sitting near to our open plan theatre kitchen. We had an all round lovely lunch. Slow service (even though not very busy), there was crumbs and food under and around our chairs that wasn't cleared/cleaned up before we sat down. Glum waitresses. I know it was a bank holiday but try and engage with your customers who are trying to be nice. Also a shame to not offer outside dining at peak times - the view is great and would add to the experience if you could eat on the terrace. This is not offered at 'peak times'. (we sat and looked at the empty tables from our inside table). A real shame. Fabulous fish, can’t fault it. Will be back! Fantastic service as usual and lush cocktails. Especially our waitress Laura friendly and very professional. We got the cold fish platter as a sharing starter. The crab was horribly overcooked. Everything else was pleasent on the platter, however much of it was  spreadable but no bread is provided. When we asked for bread we were told a portion of bread was an extra £1.50 ontop of the premium for the platter. I expressed that it seemed ridiculous to charge extra for bread when presenting a mousse and was told that the managers knew it was a problem and were reviewing it. Annoying to be told by staff that it was a known problem, yet they still could just provide a bir of bread. We paid for a portion of bread, which consisted of one slice of bread cut in half. There were 4 of us, so we ordered two portions of bread for £3, which turned out to be half a slice of bread each. Not enough to cover the platter, but it was already ridiculous enough so was not willing to order more. The rest of the meal was pleasant but very average. The halibut was a bit overcooked. Cod was cooked well, but overpowered by cauliflower. Skate wing was very good, and so was fish and chips. Is it worth the money? Probably not. I was expecting more... especially after so much effort had been put into the refurb. It wasn't a bad meal, but I wouldn't reccomend it to someone asking for local suggestions. Lovely food and atmosphere overall - Buoy Bowl was delicious - light, crispy batter - and good squid etc. The oysters good too. Only criticism is that the skate was overcooked sadly as everything else, including the green veg,  was excellent. English wines great idea but sad that the Ashford Chardonnay was out of stock and nothing to replace it, limiting choice of wines per glass. Lovely food and beautiful view. Would definitely go again. We had a delicious lunch with our two young children. The setting is lovely overlooking the coast, the seafood is excellent, interesting wine list focussing on English wines, knowledgeable and kind staff. We had a super time. Wonderful seafood and really nice helpful staff. Went to this Restaurant for Sunday lunch as a special anniversary treat, Really nice touch to receive a compliment glass of Bubbly, Roast beef and all its trimmings cooked and served to perfection, LOVE this place. Lovely environment, amazing food, staff were brilliant at first but then a change over towards the end seemed to result in a mess up with the bill that left a bad taste. The bill was requested, provided but then as we were working it out, they came over and said there had been a mistake, took the bill away and reproduced one with more service charge added I assume because we were classified as a group (although only 6 adults and a 1yr old). The establishment is top quality and was very busy so sure enough profit would have been made to overlook YOUR mistake. Out of principle we refused to pay the additional group service charge but this is not the point everything had been lovely and then your mistake left a bad taste, would advise better decisions by management in future. Food and atmosphere was superb, although they forgot our sides and we were served them when I had to eventually stand up to ask for them and we got them towards the end of the meal. We were completely forgotten about once we got our mains and again I had to go up and walk up to staff each time for drinks etc ....I believe the manager gave me a glass of wine for free as we still hadn’t got a glass of wine we waited for and I hadn’t noticed that the waitress had simply chucked dessert menus on the table when I went up to ask to see the dessert menu. I was offered a complimentary glass by the manager. i would go back again, but we would have liked some attention. Perhaps it’s the young staff being guided to check on tables. They are missing out on bigger tips and people spending more money! Lovely restaurant to have a meal, the decor and environment of the restaurant is amazing and the food and service is exceptional. When we arrived at 7.15 p.m., 15 minutes before our table was booked we wanted to have a drink and take it on to the balcony, so that our guests could appreciate the view. We were told that it was closed at this time of the year, and that the door could not be opened as people were sitting near it. We then saw throughout the evening people going out on to the balcony, to smoke and with drinks, both from the table right by the door and from other parts of the restaurant. This was disappointing. Food was very good, staff was pleasant and friendly. The cocktails were delicious, overall experience delightful. All of the food was amazing, the service was great and very friendly, and it was a beautiful spot for a special dinner. Lovely views. Fresh tasty fish. Good customer service. Thank you.